Home > Tips and Technique > Are Inflatable SUPs Any Good? The Pros and Cons of Blow Up Paddle Boards. Are Inflatable SUPs Any Good? The Pros and Cons of Blow Up Paddle Boards. So you want to get into paddle boarding and you’ve heard about inflatable paddle boards. But you have this image in your head about the inflatable toys you played with as a kid that used to leak all the time. When you stood on them, they couldn’t bear your weight. And they deteriorated when you left them out in the sun too long. Are inflatable paddle boards like that? Are inflatable SUPs any good? Read on and lets break down the advantages and disadvantages of blow up paddle boards. This is probably the first reason why inflatable paddleboards were ever made. 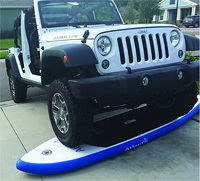 Loading your rigid paddle board on top of your car rack isn’t that easy. Neither is it easy to store it away after a long day of awesome paddling. And bringing it with you on a plane is a hassle to say the least. An inflatable, blow up paddle board doesn’t have these problems. Deflate it and roll it up into the size of a sleeping bag. And storage and transport become much easier. 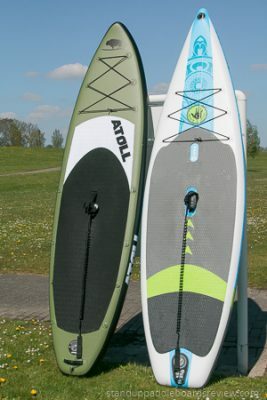 An inflatable SUP board is light compared to its solid cousins. This makes it easier for you to hand carry them to the waters. 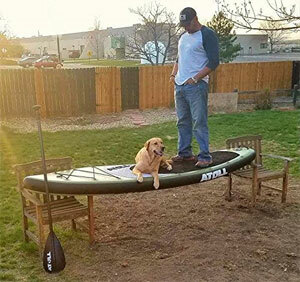 The Atoll paddle board, for instance, only weighs 19 lbs. Even my two young daughters can carry this board between them. This is the general doubt people have when considering this type of board: Can it handle my weight? Won’t it sink underneath me? The answer to these questions of course depends upon the size and quality of the inflatable SUP you get. The iRocker All Around SUP can carry up to 435 lbs. That should be enough for you, your friend and your dog, don’t you think? Take a look in the comparison table on this page about the best 15 inflatable SUP boards. You’ll see that the iRocker All Around SUP can carry up to 435 lbs. That should be enough for you, your friend and your dog, don’t you think? When you inflate an iSUP to the required psi, you’ll be surprised how rigid it gets. Not like the inflatable toys I mentioned above at all! When you get a quality inflatable paddle board, it won’t bend, wobble or sink beneath you. Yet the surface of an inflatable SUP is still softer and more forgiving in case of a fall than the surface of a solid SUP. It is quite ironic for something to be both rigid and soft, but the iSUP board is like that and it’s quite good. This might be hard to believe in but you’re in for the surprise. 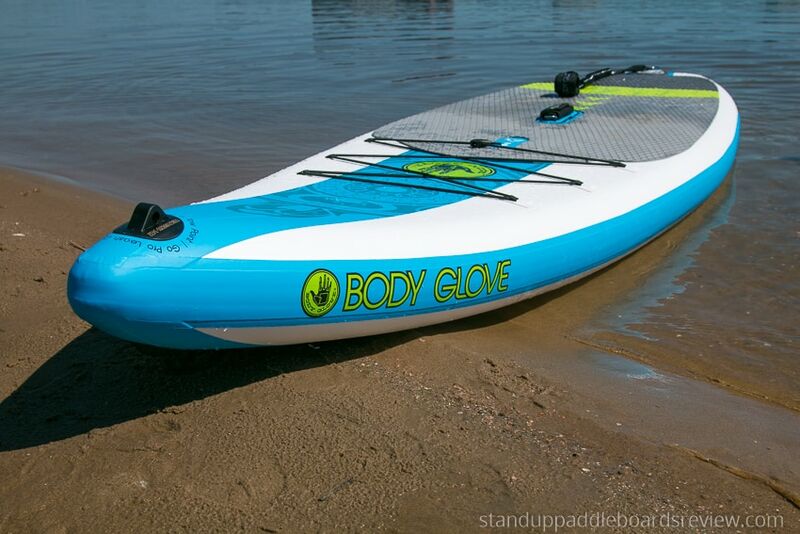 Inflatable paddle boards are perfect for paddleboarding near rocky shores and on rivers. Boards made of fiberglass tend to get dinged once they hit rocky surfaces. Inflatable boards bounce right off. Note of caution: this does not mean iSUP boards are invincible. They can still get holes once poked by exceptionally sharp stones. 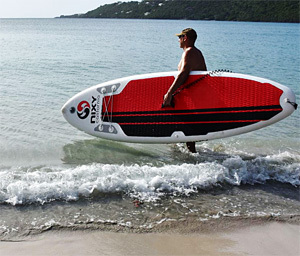 But over all, higher quality inflatable SUP boards are very durable. As soon as you arrive at your paddling location, you might be ready to head straight into action. But hold up! You still need to take some moments to inflate your paddleboard. Inflating can also be tiring especially if you only have the hand pump that comes with your iSUP board. If you like to speed things up, you may want to consider investing in a foot pump or a SUP electric pump. You may want to show off your rad SUP skills as you ride the waves and make speedy twists and turns. 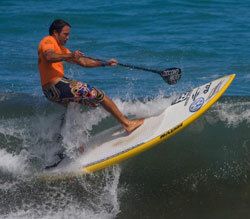 For SUP surfing you’re best off with a rigid surf paddle board. Inflatable SUPs have thick rails (the sides) with a lot of buoyancy that are hard to sink into the waves. So, while you can use inflatable SUPs for SUP surfing, rigid paddle boards are better. The same is true in terms of speed. There is a reason that most dedicated SUP racers use rigid paddle boards. Hard paddle boards are still faster than inflatable boards. One thing to look out for is that a paddle board can carry your weight. If you try to ride a board that can’t carry your weight, it will sink in the middle giving you a poor experience. Cheaper inflatable SUPs are great if your budget doesn’t allow for a more expensive model. But do keep in mind that cheaper inflatable SUPS usually have a lower weight capacity. Another common reason for too much flex is not inflating the board to the proper psi (air pressure). Manufacturers will mention the right psi for their boards. 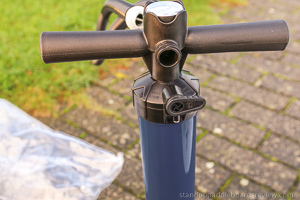 Many boards need to be inflated to 15 psi, some even go up to 20 psi. Keep in mind that the higher the psi, the more rigid the board will be and the more buoyance it will have. But also the harder it will be to inflate with a manual pump. Price is not an issue when making the decision. Sure, you can get a cheap inflatable paddle board for US$ 300 – 400. And if you’re on a budget or don’t weigh that much, that may be a good option. But in general, you get what you pay for. And I would tell you to go for a better stand up paddle board. And since these boards are of higher quality, many of them aren’t that much cheaper than solid SUPs. So, are inflatable SUPs any good? Are you looking for a board that is easy to ride, stable and somewhat cushions a fall? A board that is easy to travel with and store? A board that is durable and won’t crack or dang when you encounter an occasional rock? Aren’t you primarily intending to SUP surf or SUP race? If so, an inflatable paddle board seems a good choice for you.